UNM Re-designated as a National Center of Academic Excellence in Cyber Defense Education and Research through 2022. The National Security Agency and the Department of Homeland Security have designated The University of New Mexico as a National Center of Academic Excellence in Cyber Defense Education (CAE-CDE) and Research (CAE-R) through academic year 2022. 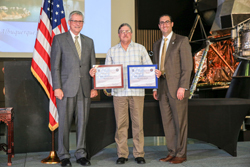 Dr. Steve Burd received UNM's certificates during the National Cyber Security Summit in Huntsville, Alabama in June. Learn more about the Information Assurance Program.